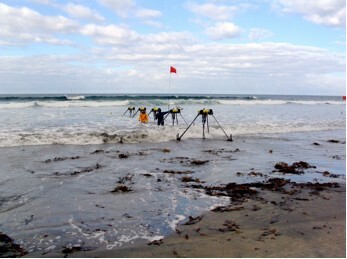 Home/People and Sound/Research Ocean Physics/How is sound used to measure waves in the surf zone? 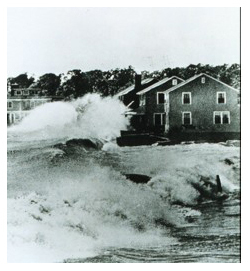 Hurricane Carol (1954) destroyed hundreds of summer cottages and homes. Huge waves bound into beach front homes. Photo courtesy of NOAA Photo Library. Waves generated in distant storms roll across the ocean, eventually reaching shore. As the water becomes shallow, the waves break, spraying foam and running up on the beach. Nearby beaches can have very different kinds of surf. For example, Black’s Beach, near San Diego, is a world-renowned surfing spot with powerful waves, while just a few miles down the coast, La Jolla Shores Beach usually has gentle waves suitable for scuba divers, kayakers, and beginning swimmers. How can the surf be so different at beaches so close together? Understanding beaches and the surf zone is vital to coastal development and living wisely along the coast. About half of the U.S. population lives in coastal counties. In particular, submarine canyons located near shore can have strong effects on the incoming waves and the surf zone. Submarine canyons are narrow, steep-sided valleys on the sea floor that resemble river canyons on land. The Nearshore Canyon Experiment was conducted off San Diego, where two deep submarine canyons come in close to shore. Scientists measured how submarine canyons affect wave propagation and nearshore currents. A large number of Acoustic Doppler Velocimeters (ADVs) and Acoustic Doppler Current Profilers (ADCPs), as well as many other instruments, were deployed. Acoustic Doppler Current Profilers (ADCPs) and Acoustic Doppler Velocimeters (ADVs) both measure the speed and direction of ocean currents by measuring how the frequency of a sound changes as it reflects from a moving object. ADCPs are used to measure ocean currents and how they vary with depth over distances extending up to several hundred meters away from the instrument. (for more, please see: Technology Gallery: Acoustic Doppler Current Profilers and How is sound used to measure currents in the ocean?). In the Nearshore Canyon Experiment, ADCPs were installed just above the seafloor seaward of the surf zone. They looked upward to measure currents throughout the water column. ADVs measure the current in a small volume, making them useful to study small-scale, turbulent currents such as those in the surf zone. They can be designed to measure only horizontal currents (2-axis) or currents in both the horizontal and vertical (3-axis). 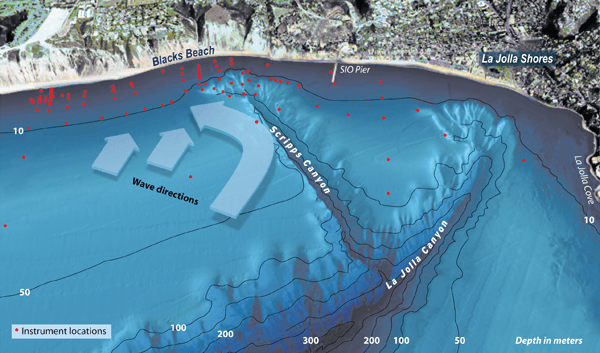 When waves arrive from the northwest, the measurements showed that the extremely rapid change in water depth at Scripps Canyon changes the direction of the waves, redirecting them toward Black’s Beach (large curved arrow in figure below). These waves combine with the waves arriving directly from the northwest (straight arrows in figure below) to cause exceptionally high waves at Black’s Beach. At La Jolla Shores Beach, the waves are low because Scripps Canyon redirects them toward Black’s Beach. The Scripps and La Jolla submarine canyons steer and focus wave energy near San Diego, CA. 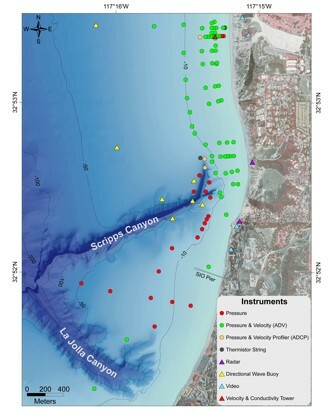 Red dots show the placement of wave-measuring instruments from the Nearshore Canyon Experiment. (Image courtesy of Scripps Institution of Oceanography, University of California, San Diego). SonTek/YSI, Ocean and Coastal Monitoring.